This weekend I attended an event that was majority attend by women, and it was filled with a ton of different types of vendors and such relating to all different things. I went in hoping to visit beauty ones or nail related ones. Sadly there really weren't any. There were 2 mani ones I would say that we're being visited a lot because of the freebies and I was amazed by the line of people at one of them. They were giving away free fake nails and applying them for people and the line was huge I was amazed and saddened to see that many people wanting fake nails. Plus just walking around I noticed the majority of people there had fake nails on. I know not everyone notices these types of things but I think it's pretty obviously I would! 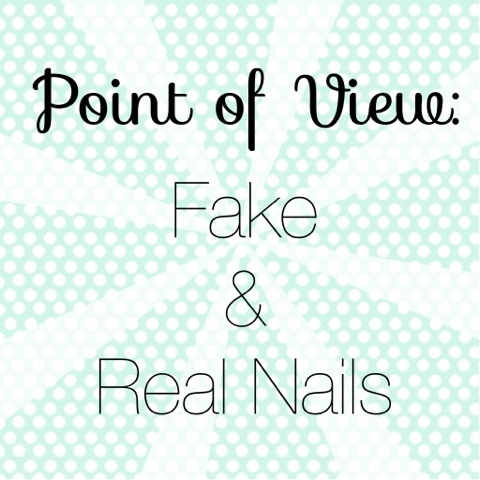 ;) I love nails and love seeing what people are wearing but to me fake nails just aren't what I want to see. Now also I have noticed after people ask me about mine being real or not we then start chatting about nails, and they typically start talking about how they have to do fake nails. The reasoning they give is that theirs are not strong or not long enough and so on. This also goes for those who bite. Thing is, most often the reason your nails are not strong enough is because you have fake nails or have had them. I have never heard of someone saying they have used fake nails and then had taken them off and had fabulous nails under neath. Maybe I just haven't talked to the right person but really I haven't ever heard that. Most who take them off then have damage afterwards and some have permanent damage that can't be fixed. To me that all is just really sad because with effort you can have your nails look nice and have them be YOUR nails! I mean if you take that time out of your day to go get your nails done couldn't you just take that time at home and do them yourself? I have a friend who had acrylic nails, she had them because she wanted nails and she was typically a biter and so her real nails were super short. However after we were around each other enough she decided to have me help her get her nails to the point where they were her real nails. Her biggest thing to over come was the biting and picking. I think the biggest thing to start her off was having her always have something on her nails, and not the fake nails that she had used in the past. Didn't matter if it was color or just a shiny coat. Just something had to be there so when she would look down they wouldn't just be plain, and then the thought of "oh I don't want to mess them up" would distract from the urge to bite. That worked. We made it so I did her nails weekly and got them to the point where she was ready to have more than just clear. We then started working with the Naked Manicure by Zoya. We chose the Naked Manicure because she loves the classic look of a thin French tip and having it go with anything, and that is a part of it but the main part that was helpful in the kit was the base coat. The base coat in the system is great for strengthening your nails and getting them in a healthy condition. We did the naked manicure starting when it was released this summer and we still do it weekly and her nails have gotten to the point where we actually need to file them down because they are to long for her liking. That means they are growing and they are her real nails! She no longer goes and get fake nails because there is no need and her nails are healthier than ever. As the person how helped her and has seen the change I really feel like anyone can do it! Yes it's hard to change habits but it can be done and it's really worth it. Thanks for taking you time to read!